When I think of Trigger Fish and Cod, I immediately think summer and winter fish. You normally associate Cod with autumn and winter fishing, and Trigger Fish are normally the last of the warm water summer species to show up. 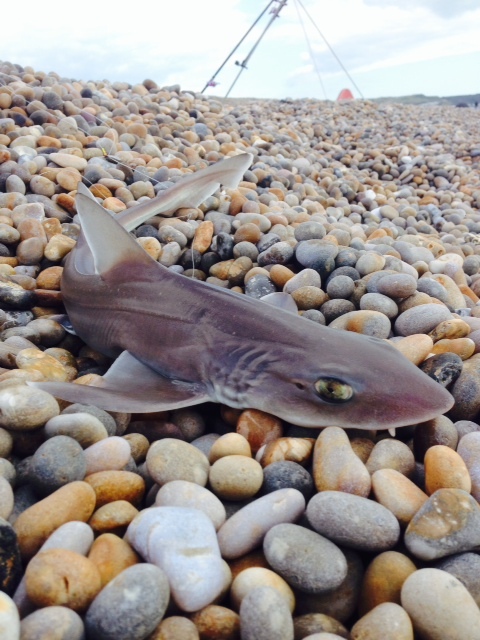 Right now we are seeing both at the same time on Chesil Beach and I am not sure which is more unusual. I am not sure if anyone has caught both in the same session yet, but that would be some achievement. There was a lot of people fishing Chesil this weekend, especially down at the Portland end of the beach. Weymouth Angling Society held an open competition there on Saturday. Some good catches were recorded. The wining weight caught by Saul Page was 17lb 4oz. It was great to see lots of species landed including Trigger Fish, Cod, Scad, Mackerel, Tub and Red Gurnard, Red Mullet, Pout, Poor Cod, Dogfish and Smoothound. 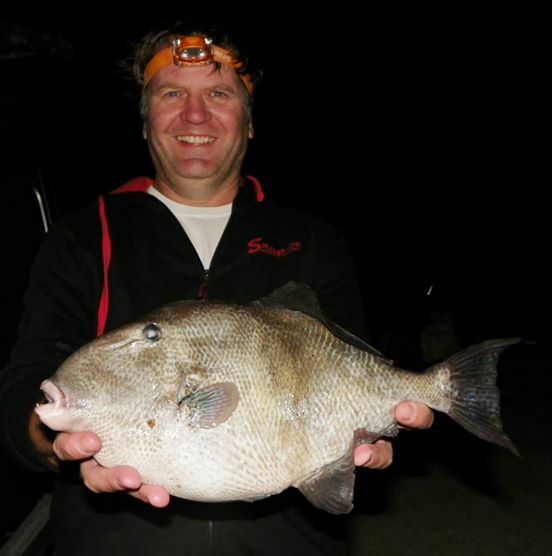 Anthony Buick managed a number of Trigger Fish including this 3lb 8oz one. I fished the Ferrybridge end of Chesil yesterday for the first ever time from about 9:30am until 4:30pm. I had my 78 year old dad with me so we didn’t walk too far from the car park. Fortunately there are some boards on the shingle which made walking easier! The beach was pretty busy when we got there with a steady stream of anglers arriving through the day. A beautiful day with a light NW wind gradually moving to the W during the day. The sea was pretty clear with only a light swell. Bait was squid, Sand eel, blacks, peeler and rag. I fished a multitude of rigs and bait combinations. I kept a big bait on one rod the whole time (whole squid, 2 sand eels or 2-3 blacks/squid on a 4/0 pennel) and fished two rods with a 2 hook clipped down rig (size 2 circle hooks) with rag/squid or peeler or a simple 1 or 1/0 pulley with crab. 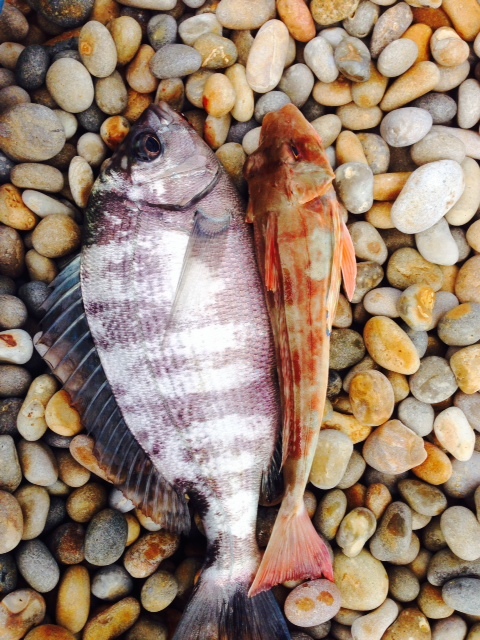 Targets were bream and gurnard (never having caught either) with the hope of a bass and/or an early codling. The fish came slowly but steadily during the day. First catch was a Mackerel as I was retrieving the rod. Then came a small pout on the rag/squid combo. This was followed by a starry smooth hound (again to rag tipped with squid), a bream, a gurnard, another smooth hound and several more mackerel. The large bait was untouched all day as was the peeler! Even the hounds were jumping on the rag/squid and getting hooked on the size 2 hooks! All fish were caught at longer range – my Dad fished about 30yds out all day and unfortunately didn’t have a bite. I can’t think of many beaches where you can catch 5-6 species during one session. I specifically wanted bream and gurnard so was especially pleased with that. A red mullet would have made the day complete but it wasn’t to be. I spoke to one angler at the side of me who hadn’t caught much – a hound and a couple of mackerel. There were some people feathering early in the day who seemed to be catching plenty. A great day and definitely not the last time I will fish the Portland end of the beach. Will look to return in sept/oct to catch the back end of the summer fishing and hopefully the start of the cod season. 4 Responses to "Trigger Fish and Cod"
Fished chesil last night with nic lomax & between us had around 15 smoothies,pout,whiting,dogfish,gurnard a monster bass (probably 10lb+) a plaice & to finish up a cod last cast! Sounds like a fantastic session. Great report. I too am dismayed by rubbish left on the beach by anglers. Leaving fish dead on the beach shows a distgusting lack of respect for life & complete ignorance as to the state of fish stocks in the UK. Maybe it’s time to try a new hobby.